Cowboys and a dinosaur. A Willis O'Brien (KING KONG) project finally realized with animator Ray Harryhausen. Harryhausen's effects are outstanding. A scene with the allosaur inside a huge cathedral is a knock-out! Two men, having a duel in the modern world are hijacked by the comet and find themselves in its atmosphere with cave people and dinosaurs. Vampira The Movie chronicles the story of Maila "Vampira" Nurmi living on the very edge of show business and her rise to celluloid cultdom 50 years later. CLICK IMAGE FOR DETAILS. Lionel Atwill, Fay Wray and Dwight Frye in a very good vampire-mystery film from the 30's. Moody and well-acted. Stars Pia Degermark. Directed by Freddie Francis, who broughht us varios Hammer films and THE HOUSE THAT DRIPPED BLOOD. Upon returning to a family castle, a Hollywood movie star finds the thing infested with vampires. Call Orkin! Also known a: THE BLOOD DRINKERS. Stars Ronald Remy as the Vampire King. Remy is a bald, fanged and caped evil vampire....I mean evil. No sympathy for this guy. CLICK IMAGE FOR DETAILS. John Beal as a doctor addicted to a bat serum that transforms him into a hideous vampire. Jekyll/Hyde meets Dracula. aka: MARK OF THE THE VAMPIRE. Also stars Kenneth Tobey of THE THING. Was released to TV as MARK OF THE VAMPIRE. Cool drive-in extras! THE VAMPIRE (1957/John Beal/Ken Tobey)/THE RETURN OF DRACULA (1958) - Double Feature DVD. CLICK FOR DETAILS. A twenty movie set of vampires and their kin! Monster infested crypts and blood-seeking creatures of the night at every turn. CLICK IMAGE FOR TITLE LISTING AND DETAILS. Over six hours of mystery, murder and deception. "The Vampires" are a crime ring and not supernatural beings. Though some imaging lends a spooky look to Vep who dresses in tight black clothing with, at times, bizarre make-up and bat-like cape. Ten chapter serial. Five DVDs in a box with 10 movies. Believe it or not, my favorite part is the shorts features included on each disc! Bonus faturettes like a spooky Little Rascals short, Max Fleischer cartoons and much more. CLICK IMAGE FOR LISTING AND MORE. Ten episodes of the never-aired Boris Karloff TV spook show, THE VEIL. Similiar to THRILLER, TWILIGHT ZONE or NIGHT GALLERY. Boris Karloff hosts and stars in tales beyond THE VEIL. CLICK IMAGE FOR DETAILS. Eight episodes of the never-aired Boris Karloff TV spook show, THE VEIL. Similar to THRILLER, TWILIGHT ZONE or NIGHT GALLERY. Boris Karloff hosts and stars in tales beyond THE VEIL. 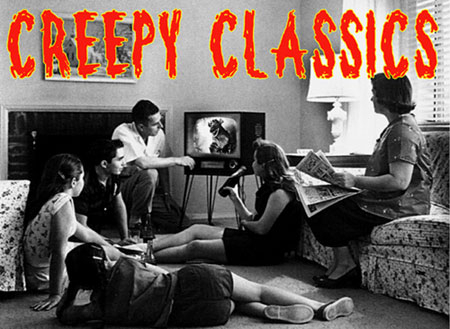 Classic creepy TV! 10 episodes of the never-aired Boris Karloff TV spook show, THE VEIL. Similiar to THRILLER, TWILIGHT ZONE or NIGHT GALLERY. Karloff hosts and stars in tales beyond THE VEIL. This is the best quality set on this show. CLICK IMAGE FOR DETAILS. Stars Robert Vaughn, Elke Sommer, Felicia Farr and Boris Karloff. Riding off the success of Vaughn's MAN FROM U.N.C.L.E. series, this is an international spy thriller involving mind-control. One of Karloff's last really good roles. 50 episodes of this classic TV show...that was kind of a cross between Believe It or Not and The Twilight Zone. Lots of early apearances by actors and actresses that went on to become noteworthy stars! A man mutates and craves human flesh. Filmed in New York City shut down by a blizzard in real life. Hammer Quatermass movie saute. Directed by Joshua Kennedy. Plus, a bonus awesome stop-motion monster film by Ryan Lengyel - THE BEAST FROM TWENTY ZILLION YEARS AGO! THE VIKING WOMEN VS. THE SEA SERPENT (1961)/TEENAGE CAVEMAN (1958) - Double Feature. CLICK IMAGE FOR DETAILS. The pair of films with psychologists investigating children with incredible IQs and a form of telepathy. Soon it's discovered the the existance of humankind, as we know it, could end --- soon! Five feature films from Vincent Price: THE BAT, THE LAST MAN ON EARTH, THE JACKALS, SHOCK and HOUSE ON HAUNTED HILL. Plus Digital as well as the hard copy DVD! Re-mastered DVD set from the MGM vaults...Vincent Price's AIP classics: TALES OF TERROR. THE PIT AND THE PENDULUM, THE ABOMINABLE DR. PHIBES, SCREAM AND SCREAM AGAIN, MADHOUSE and THE MASQUE OF THE RED DEATH. VINCENT PRICE DOUBLE FEATURE - THE LAST MAN ON EARTH (1964)/HOUSE ON HAUNTED HILL (1958). CLICK IMAGE FOR DETAILS. Four great Vincent Price films in this collection: THE PIT AND THE PENDULUM (1961 with Barbara Steele), TALES OF TERROR (1964 with Peter Lorre and Basil Rathbone), MASQUE OF THE RED DEATH (1964) and MADHOUSE (1974 with Peter Cushing). This DVD box set is nicely packed with the movies: TALES OF TERROR (1962), THE RAVEN (1963) and THE PIT AND THE PENDULUM (1961). This study box set includes a full color booklet and a study box package. Includes the Vincent Price movies: TALES OF TERROR, TWICE TOLD TALES, THE ABOMINABLE DR. PHIBES, DR PHIBES RISES AGAIN, THEATER OF BLOOD, MADHOUSE, THE WITCHFINDER GENERAL and a disc of featurettes on Vincent Price and his films. Six classic sci-fi flicks from the vaults of Columbia Studios: THE 27TH DAY (1957), THE NIGHT THE WORLD EXPLODED (1957), THE H-MAN (1958), 12 TO THE MOON (1959), BATTLE IN OUTER SPACE (1960) and VALLEY OF THE DRAGONS (1961). Two disc-set. A DVD set packed with comedy shorts from Vitaphone in the early thirties. Stars include Fatty Arbuckle and Shemp Howard. Shot during the depression era in 1932-1934...19 shorts including SALT WATER DAFFY, ART TROUBLE, I SCREAM, PAUL REVERE JR., BUZZIN' AROUND and many more. A DVD set packed with comedy shorts from Vitaphone in the early thirties. Starring Shemp Howard. If you grew up watching monster movies, you probably watched the Three Stooges too. 21 shorts included on this Shemp set! MY MUMMY'S ARMS, TAKING THE COUNT, PUNCH AND BEAUTY and many more! Stars Boris Karloff, Beverly Tyler, Murvyn Vye and Elisha Cook Jr. A developer in the South Pacific is reporting missing workers. Karloff leads an investigation and heads out to this remote jungle. He and his intrepid crew find voodoo and man-eating plants! Both the original movie and the MST version on one disc. George Zucco as a gas station attendant moonlighting as a voodoo priest, a cast of beautiful female zombies AND Lugosi in a wonderfully restrained role. CLICK IMAGE FOR DETAILS. Stars Richard Basehart, David Hedison and Del Monroe. The adventures of the submarine - The Seaview. The explore the uncharted depths and find drama and giant monsters! CLICK IMAGE FOR DETAILS. One hour episodes include...of the classic TV Show! CLICK IMAGE FOR DETAILS. The classic sci-fi adventure TV show...CLICK IMAGE FOR DETAILS. The classic TV sci-fi adventure of the 1960s. CLICK IMAGE FOR DETAILS. More monsters, more undersea adventure as the show cruised into the third season with werewolves (!) and more. Stars Mamie Van Doren. Originally a Russian film called PLANET OF STORMS that was hacked with a meat clever and new footage added by director Peter Bogdanovich. CLICK IMAGE FOR DETAILS. Soviet sci-fi with American segments tying it together. The American segments include sci-fi 50's queen Faith Domergue and Basil Rathbone. CLICK IMAGE FOR DETAILS. VOYAGE TO THE PREHISTORIC PLANET (1965)/FIRST SPACESHIP ON VENUS (1959) - Double Feature. CLICK IMAGE FOR DETAILS.